It's the end of the year and I haven't been on here as much as I would have liked. I've been busy with yoga business. I tell people right now it's a lot more work doing the business side than the yoga - everyone seems to be, 'oh it must be tiring doing all that yoga!'. It's the business side of it that is most tiring, that requires a lot of mental power. Perhaps one day I shall write about the yoga of business. It's been a happy year - a year of figuring out what I can do, how I can improve, what I can contribute to the world at large. It's been a stressful year - figuring out finances and trying to manifest abundance. It's been a really good year with the cute guy. It's been an up and down year with the parent. It's been about the same with my brother. Lots to look forward to in 2015. I've got lots of plans - just need to figure out how to bring them into being. Wish you all the best for 2015! May it be a year of growth and abundance, of love and family. This week I'll be attending a four-day Mediation Skills Training Workshop. I'm not yet sure why. I'm sure at some point in the future I'll figure it out. For now, I have the opportunity to do it and why waste an opportunity? I am excited - because I like learning new things. Nervous - because I do not like being in front of people. Optimistic - because surely this can only lead to positive things. Anxious - because I will not be home for four days; hopefully the brother, parent and Cat Chile get along well. Aggravated - because I had to find four outfits of a business-suit nature and after just over a year of not wearing such it's a bit frustrating. November and I find myself thinking that it's been just over a year since I left my job. It's been just over a year and a half since my mom passed away. Nine months since I've started my own business. Time passes so quickly and we don't even realise that it is doing so. We are caught up in living and I think that maybe that is a good way for time to pass. What is time passing? Moments that flow from one to the other. Seconds into minutes into days into months into a year and more. I am different now than I was before. You are a different person than the one you were when you opened up this site and started to read. I think it is interesting how we choose to spend our time. What do we give our attention to? Who do we stay with? What do we want to do most? I think there aren't enough people in my country thinking about what to give their attention to. Not enough people thinking about what is important for our country - if we were to still be around twenty years from now, what kind of world will we be living in? Perhaps there are people, perhaps not. This month I think about me - who I am, what I'm doing, where I want to go. It's important I think. A lot has happened in the time that I have not written here. Lots to figure out and work through. I'm 31 now and it is a strange thing to hear myself say. Adulthood is strange. Owning a business is strange. Wondering about the meanings and origins of words as I write them is strange. I feel introspective and perhaps this is why I'm returning to the blog. Need some space in which to work out my thoughts. What am I thinking? I'm thinking that I need to make time to do more reading relevant to life and living. That the physical body has built-in phases of life... I'm currently thinking about the possibility of marriage and kids and it's freaking me out a bit as I know that not so long ago the thoughts of such would not have occurred to me at all or would not have lingered as long. Are we hard-wired to start thinking about such things? There are those who don't so I don't think we are but... it's a bit of a possibility. I've been thinking that owning a business is fun and interesting and scary all at the same time. That I'm not sure I'm entrepreneurial at all or that I'm in any way interested in 'business' - somehow I've decided to do my own thing and am now where I am. I've been thinking that hopefully at some point all of the education I've had will resolve into knowing how to market this business and do my accounts properly, figure out what people want and be able to provide for them and myself. I've been thinking that money is an annoying thing to think about so I'm now thinking in terms of prosperity and abundance. I've been thinking that there are a lot of people moving through their lives without giving thought to how they've come to be here or where they're going. Been thinking about relationships and interactions - about give and take and emotional investment. Have been thinking about past relationships and what they've taught me. What have you been thinking? Any thoughts on what I'm thinking? I've been busy since my last post and I've been mostly staying off my computer. Staying away from writing anything in any form or fashion. Over the past week or two though I've been thinking about this blog, about things that I could write, about things that are interesting. I've been thinking about future writings - I'm planning out a book in my head and feel that sometime soon I'll be sitting down to start working on that. Once more I am writing. Hello world, how have you been? Sometimes I sit to write a post and words flow from my fingers. Sometimes I go through a day with thoughts and bits of phrases floating through my head that I know will eventually end up here on the blog as some sort of post and in some sort of comprehensive fashion. Sometimes I begin writing and am interrupted so many times that it's hard to figure out how to weave the words together. Sometimes I just stare at a blank screen because there's so much that I want to write that I don't know where to start. Sometimes I stare at a blank screen with a mind that is completely blank and then some minutes later I find myself wondering what I'm supposed to be doing. Most times the words are within reach... but, sometimes they're not, and that's when it's hardest to post. It's Easter Monday and I haven't had any sort of chocolate. Something is not quite right here. Yes, I did go looking for chocolate eggs very late this year (as in yesterday) and so perhaps all the Easter chocolate is sold out? Or something? I've had very excellent cheesecake, and ice cream with chocolate in it, but no specifically Easter chocolate. I feel a bit grumpy about this. Ah well. Happy Easter Monday! Long weekend here in Trinidad and I've spent most of it with my Kindle. Sometimes one just needs to get lost in a book... or three. That's the number for this weekend - three books. Read and done... though I may reread again and again as I tend to do. Two of them I've read to know what they're about - my younger cousin was gifted with a Kindle and in trying to find books for her I just added these two as they were on the Young Adult's Best Seller's list. One I read as I discovered it on my Kindle... I'm sure I put it there - I'm just not sure when. The first: Miss Peregrine's Home for Peculiar Children by Ransom Riggs. It's listed as fantasy and that's always been one of my favourite genres. There's a hero's journey, a search into the past and family, the discovery of secrets which aren't secrets and photographs which were collected by the author and apparently inspired the book. It's a really good read. The second: The Fault in Our Stars by John Green. I cried through most of this book. I may need to reread perhaps a few years from now. It's about a teenager who has cancer and a who-knows-how-long life expectancy who meets and falls in love with a boy. I'm not going to write spoilers. The details in the novel are very well-written - the cancer patients, their parents and the world around them. It's a beautiful book but perhaps I need time and space before trying to reread. The third: The Secret Keeper by Kate Morton. At first I wasn't sure why I was reading this, then I found that I couldn't put it down, then I was sad that it was over. I would recommend to anyone. Plot twists and mysteries abound. It's also about a daughter searching into her mother's past... Perhaps there's been a trend all along with these books. History and parents and understanding of a sort. I love reading... I feel that it helps to open us up to experiences we could never imagine and allows us to relate to and further explore situations we have already been through. It's Easter weekend and although the dates are not the same as last year I keep thinking of how the weekend before my mom's passing was Easter weekend. There are special times of the year I believe. Days that are good for coming into and leaving this world. Days for growing and harvesting. Days that have their own energy depending on where the stars are in the sky and how the people are on this Earth. I'm sure there are other factors. Last year when my mom was definitely coming towards her end I had thought that Easter was a good time to move on. It's a time of new beginnings... I've always thought that death is not the end of us. Just a phase. Transition. It's a good transition period. Yesterday I did the egg white in the glass thing. What patterns do the egg white make? My brother does not know of this tradition which I found somewhat strange... but then I have no memory of him doing it with us. Just mom and I in the early morning before the sun came up, setting up to see our future. We have different memories of our parents; different amounts of time spent with them and different ways of relating to them. I'm only just realising this though I've known intellectually that this was so. I am remembering my past and thinking of my future. It's a good time to do so. It's been a very lazy day for me. I've rested and napped and overall did not do all that many productive things. Sometimes I think the best thing one can do is nothing. Or something that does not take much effort or is enjoyable or is unrelated to whatever you've been working on for some time. I did go with my aunt by her seamstress who will be sewing the slip and blouse and pleats of our saris for The Wedding. I'm fairly pleased that I won't have to think about clothes coming up to The Wedding because they would already be ready. It's interesting that now we've moved into a time where instead of wrapping our own saris and making our own blouses/slips we can pass that on to a seamstress who will do just as good a job... and who will sew the saris such that they are easy to put on and wrap. The seamstress seems to have her own specific ideas of how our saris should be and I'm fine letting her figure it out - I just want to be comfortable wearing it when I have to. It's been a good day... restful - which is definitely something I needed. Once upon a time, not many years ago, I could fall asleep anywhere, any time of day and be fully functional always. Now it seems as though I need definite periods of sleep. Now I can't fall asleep the moment I close my eyes. Now I find myself short of rest. Was awakened this morning by parent moving around - this is normal, I've always been somewhat of a light sleeper. What is not normal, or is becoming the new normal, is that I couldn't fall back asleep. Then parent wanted me to do stuff with him. Parent always wants me to be far more involved with his activities than I want to be... or that I have time for... or etc. I tell myself that one day parent will no longer be here and I will regret time not spent helping or being with him but... there must be balance. I need sleep. More of it. It might be nap time fairly soon. Sometimes I share things I see on Facebook without first fact checking simply because I'm curious about it or interested in what it says or that it makes me think. I consider my Facebook timeline to be something of a bookmark/note-taker... when I see stuff others have shared that I want to check up on I share it to my timeline. I really need to stop doing this... or find a better way of saving such things. I didn't say anything about it which I realised I should have done after people started commenting on it. I had previously read about Ishtar and have my own thoughts about her. 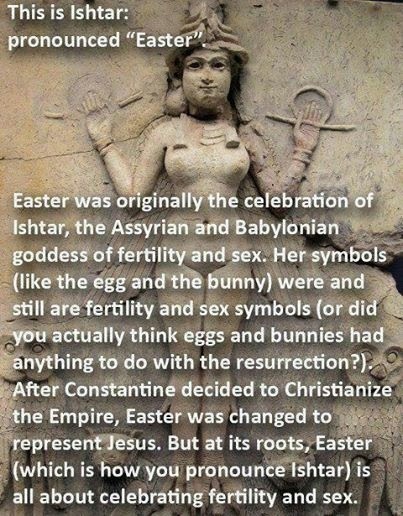 I'd also recently read American Gods by Neil Gaiman in which he makes mention of Easter and the forgotten goddess behind the holiday. I thought it interesting that this then showed up on my timeline and so I shared it. I think when people see something they should be curious about it... whether it's true or not or feels right for them. Be curious. Explore. Discover. There's so much we don't know or do know but have yet to realise. It's the fifteenth week of 2014 and I know this because today I've posted my fifteenth photo for my project 52. Some weeks I know just what I want to post and I work towards getting a photo of that. Some weeks I have no idea till I see something that I immediately think would be perfect for my project. I'm not sure that the project is working out as I'd hoped - where I steadily improve on different aspects of photo-taking but I'm enjoying taking photos... as I always do. 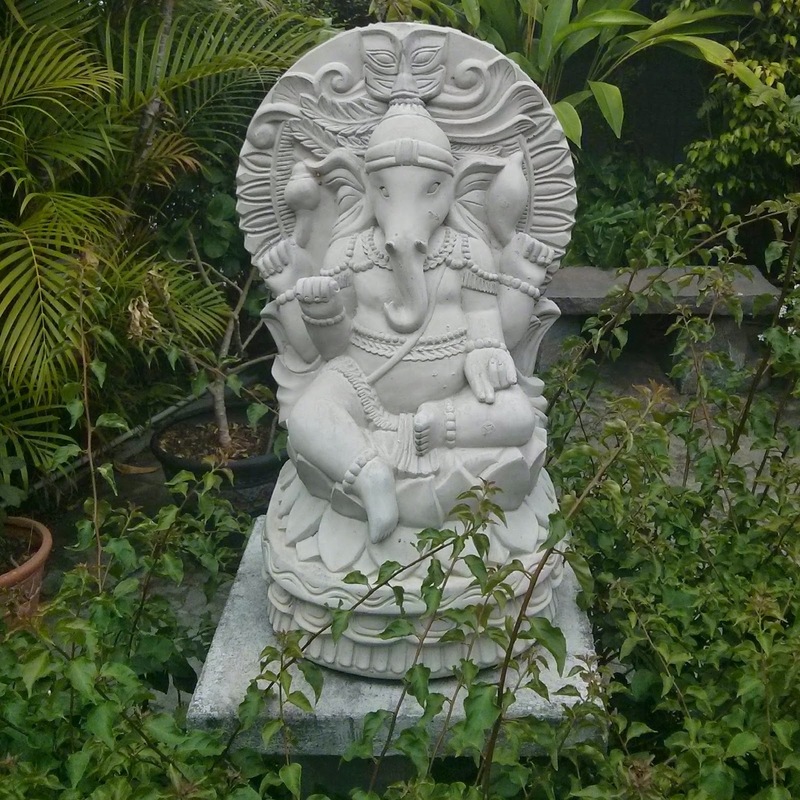 This week's photo is of Sri Ganesh and was taken after tea with some friends. Ganesh is honoured as the remover of obstacles, the Lord of letters and learning and the Lord of new beginnings. I feel that perhaps I need to give some time to honouring those principles. I've been seeing so many elephant related items that I feel the universe has been trying to tell me something. Sometimes there are so many signs nudging us along if we just take the moment to see them. Is there anything you need to take notice of? There's a full moon in the sky tonight and so I'm teaching chandra namaskars (moon salutations) in class this evening. I'm currently taking a few moments away from reading up on the postures and planning the sequence that I'll do to write this post. There's a full moon in the sky tonight and a lunar eclipse tomorrow. Take a moment to look at it, revel in the beauty of it. There's something about full moons that I've always loved. Things to do in Trinidad. It always ticks me off, just a little bit, when I hear people say that there's nothing to do in Trinidad (and Tobago). I've said before that I don't understand the 'boredom' any more and so in a similar fashion - I don't understand 'there's nothing to do'. There is always something to do. This weekend I had to remind myself that I can only do a certain number of things, that I can't be everywhere. ...and then went to Runway Shift 2014 as the assistant to the cute guy (he was hired to do event coverage). There's always something to do if you just open yourself up to experiences. There's lots to see and do here. Lots of festivals, lots of holidays, lots of people with different interests... and if you don't want to do anything... there's lots of places to just be. To relax and lime. To have fun in whatever way you please. Every so often I ask the cute guy to tell me a story, a true story about something that has happened to him or that he has done. We take turns, so sometimes I tell my own stories. It's a good way to find out about each other and the bits and pieces that make up who we are. Sometime in the future I will start asking him to make up stories; spin a tale, weave a yarn. I've always been interested in stories and perhaps this is why I'm so much of a bookworm. Books provide never-ending access to all manner of stories. Ideas, thoughts, facts and culture... all these are passed on through story. From parent to child, family to family and onward. Today I'm going to see Captain America with the cute guy and his family. I think movies are an interesting way to tell stories - it's different from sinking into a book but just as easy to have one's imagination captured by what unfolds on screen. Then too, some people find it easier to relate to images and sounds than to words. I'm thinking about how I can share my own story. This blog is part of it... writing the moments as they come... there is more to be done though and I've been thinking of how to bring it into being. Perhaps not now, perhaps in the future, perhaps as I've been doing - bits and pieces as I go along. I've been up since 4 a.m. - had a class with a private client at 5:15. I think it says a lot that I was perfectly happy to be up and about doing yoga at that hour. I taught another class later in the morning. I spoke with the principal of a primary school where I will be teaching classes for primary school students starting next month. I've looked at the curriculum for Physical Education for both primary and secondary students and wondered how I can fuse yoga and phys ed. I'm planning out blog posts in my head... not for this blog but for a future yoga blog that may not be that far off in the future. I'm thinking of retreats, workshops and who I can get to help me in some way. I've been busy... but it's been a happy day. There's been no moments of frustration or stress. Just a lightness in my being and the knowledge that for now I'm in a good space. I'm making plans so that this space can be continued. It's a lot of excitement. He's a very vocal Cat. I am told that I have him very spoilt. I do not know what people are talking about. I don't over feed him - his vet says he is most healthy and definitely not over-weight. I play with him when I can. A lot of times he comes by me to sleep. He likes to cuddle and sit on me. He likes to talk to me. He comes to greet me when I get home. 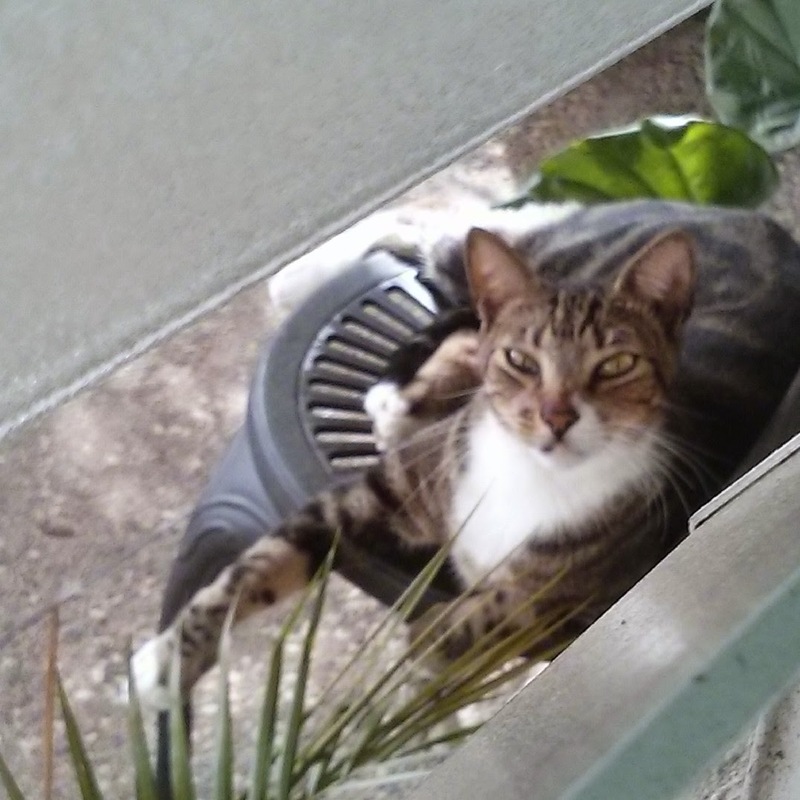 He makes noise outside my window at 5 a.m. because that's when he wants food. He sleeps away most of my waking day. He is adorable and also a major responsibility. He makes me think of what it would be like to have my own child - a mini me... a tiny person who will grow into a big person who will be dependent on me for at least 18 years. I'm not sure I can manage that. I'm not sure I want to manage that. Time will tell I suppose... and in the meantime I shall live and love my Cat Child. There have been, and continues to be, a lot of strong women in my life. The one with the most impact on my life was my mother and I know that she has made an impact on the lives of others as well. I consider myself lucky that she was able to share herself with me and that her friends now do the same. I'm taking that into my own life and passing it on. I have my own groups of girl people. Women who are each amazing in their own right and who are growing from strength to strength each day. We are trying, individually and collectively, to be the best that we can be. It's a process... parts of everyday life that makes up a whole. Today I had lunch with one of my cousins. She turned 16 this year... I do not know how she's gotten so old so quickly. I've been trying to remember what my thoughts and feelings were at that age. Trying to place myself in her shoes so that I can pass on what I have learnt. How do I let her know that she can be whoever she wants to be? That she will have as much support as she needs? That she is free to make her own choices whether for good or ill and someone will be there always? That she can do much more than she thinks she can. I'm trying to lead by example. Letting myself be who I want to be. Trusting that all will be well and that there is support whether I need it or not. These are things I've learnt and am continuing to learn. I'm passing it on. My cousin is getting married in July. It is going to be a weekend of festivities with both Hindu and Christian ceremonies. It is going to be huge. It is going to be fun. We (I've got lots of family - aunts, uncles, cousins and more) are all excited. July is not that far away and so I've decided to get a move on with shopping for clothing for The Wedding. The cute guy and I went to look at Indian wear... saris and shalwars and the like. There is a lot of stuff to look at and try on. There should be a lot of haggling... but I'm not great at haggling. The cute guy is a giant and finding stuff in his size is a bit of a challenge. I'm fairly short and finding stuff in my size is a bit of a challenge. It's interesting that we seem to have the same amount of difficulty in finding proper fitting clothing and footwear. We did find stuff though. I've bought myself a sari that I now have to carry to a seamstress to get sewn. The cute guy now has a kurta. We didn't go with the intention to buy anything but... since we found stuff that suited both of us we went ahead and bought them. He is fun to shop with and to be with. I have a date for The Wedding! We shall be beautifully dressed... at least for the Hindu ceremony... have yet to figure out the other outfit I'll wear. Sometimes I think that the males in my family exist solely to annoy me. Vex me. Make me most grumpy. I think males are strange creatures, and males who are closely related to me seem to be even more so. I do not like it. I do not like being vexed with family. I do not like being put in the middle. I do not like people not doing what they should be doing. I do not like having to point out what people should be doing. I do not like people expecting me to do stuff for them if they aren't willing to do the same. I do not like people getting annoyed if I point out that I do not like them expecting me to do stuff for them if they won't do the same. I am annoyed and grumpy. I am trying not to be. I'm still working on figuring out what I should be doing. What there is for me to offer. What I should share. There are moments of strong belief and moments of doubt and through it all I am grateful for those who stand as my guide and my comfort. I'm holding on to bits and pieces of ideas that I'd like to bring to fruition. What are you holding on to? Yoga in the Park tomorrow. I'm teaching yoga in Palmiste Park tomorrow morning and so I've been spending this evening/night working out my flow. What breathing exercises should I do? What postures will I teach? What will I say exactly? There is no exactly. I'm not yet very comfortable teaching but it is getting better. So much easier to do my own flow without having to think about how to word it and the sequence of postures. I've never thought it would be easy and I'm right about that but it is getting easier. I think perhaps all I need is more practice. Teaching is in its own way a great reward. There's something very fulfilling about getting thoughts and ideas across. Knowing that in some small way one may be helping people to deal with something going on in their lives. Introducing people to a better way to breathe and start their day. I've got yoga in Palmiste Park tomorrow morning. I'm looking forward to it as it is such a beautiful space to breathe and move in. Hopefully those who come to class will find their own joy in the experience. Hopefully I can guide them into a joyous experience. Tonight I am going to be in bed by 11 p.m. I find that I haven't been sleeping well lately... or haven't been able to convince myself that it's bedtime. My relationship with sleeping has always been a bit shaky. Sometimes (a lot of times) it seems that there is too much to do or too much happening for sleep to take place. I need to go to bed earlier. This is difficult for me because I find that I do my best work at night. Whatever I'm working on tends to come out better at night. Makes more sense... flows freely as it should. I'm a fairly early riser though... staying up late + getting up early does not equal a sufficient amount of time spent sleeping. This is why I like naps. I find that our lives today are not made for having naps and that's a sad thing. I need to make time for naps. There are studies about the optimal amount of time for naps as well as the amount of hours of sleep one should be getting. I'm not getting nearly enough. I should go to bed now. Are you getting enough rest? Today makes a year since my mother's passing. I am not quite sure how a year has already gone by. I'm glad that I made the decision to post all through April last year because now I can reflect on how I was then compared to how I am now. This is part of the beauty of putting down words - that they will be there as a reminder of what was happening in our minds and hearts. "Life changes in an instant. The ordinary instant." "Grief turns out to be a place none of us know until we reach it. We anticipate (we know) that someone close to us could die, but we do not look beyond the few days or weeks that immediately follow such an imagined death." "A single person is missing for you, and the whole world is empty." Three quotes from a book filled with so many that resonated with what I was feeling. My mom's passing shook my world - made me take a look at my life in a way that I hadn't done before because there was always something else to do. I am given to introspection but I had not done so to the level that I could have until after my mom's funeral and the realisation that it was time for me to be doing more with my life. I've made some changes and am heading in a direction that I am happy to be heading for now. Today is the 9th day of the 40 day Meditation Retreat observed by members of the Blue Star. In 2011, I encouraged my mom to post about her thoughts on the 40-days. On the 9th day of the 40-days in 2011 my mom wrote about 'freeing the soul from human limitations'. I take comfort in her words then as well as the words from today's message. This year the messages are based on Self-Mastery - today's message speaks of 'readiness'. How ready are we for the step we want to make or think we should make? How ready am I? What steps do I want to take? I'm feeling all the feelings and letting them be part of my inner guide. How ready am I to move forward? What does moving forward mean for me? What does it mean for you? Each day that passes I think of my mom... I know she'll always be with me and, in asking myself these questions and seeking to find the answers, I know that this is what she would have wanted for me. Always love to you, my mama. Haven't been here in a while and so I thought I'd return and do another month of posting every day... I'm already starting a day late so this month shall be from the 2nd of April... till at least 30 days later. It's April again... my favourite month in the year - mostly because it's my birth month - it's always been a happy month for me. This year, as last year, it starts with a combination of happy/sad feelings. I've got stuff to work through... I feel I will always have stuff to work through. It's April and I'm thinking of where I was last April. My physical, mental and emotional state, my family and life on the whole. There have been many changes. Through it all, and especially within the past three months, I've found myself thinking of my younger self... and my future older self. Sometimes I'm teaching my yoga class and there will be a disorienting moment of being on the other end... of being a teacher instead of a student. Echoes of teenage experiences of yoga and tai chi classes. Moments of figuring out what I should be doing, what people want me to do, what I want to do. Sometimes I move through my day and feel what I could be... what I shall grow into. Future Me is one who has taken all she has known, learnt and experienced and used such to transform herself into an extraordinary person. I don't know how long it will take to get there but I do know that it is coming. I've always believed that all moments are connected. That we can reach back into our past and forward into our future. Send comfort to a past shaky moment, send positivity to a future moment. This month I shall record moments... or not. This month I take to reflect. 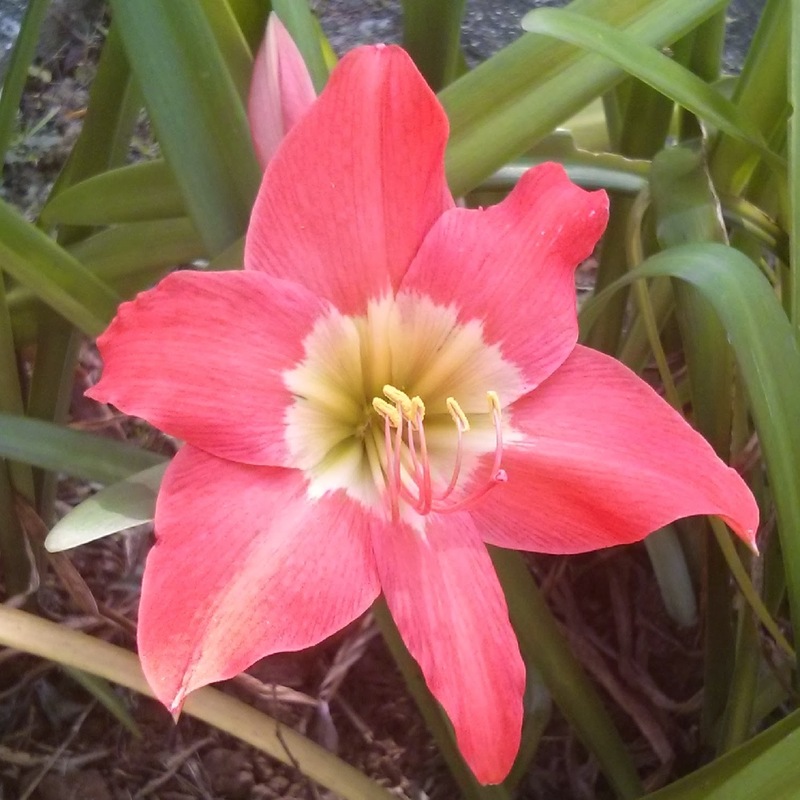 It's our first lily of the year and it brings with it much joy with just a hint of sorrow. Joy because I love these flowers... the colour of it and how it blooms around this time of year. Sorrow because last year they bloomed in time and in such profusion for my mom's last month with us. This lily reminds me of how much time has passed, of how much changes I've made in my life, of how easy and yet strange it is to move from one phase to another. Last week I started teaching public yoga classes in our new studio space. It is exciting and exhilarating and scary and bewildering. It feels like stretching - my body and mind. I'm not yet quite confident with my teaching style... being in front of a group of people looking to me for direction... but, I will get there and in the meantime these experiences help my own practice. Helps me sink deeper and explore more of what I would like my life to be and what I would like to share. Yesterday I taught my first private class and it left both my client and I happy. I find it easier to interact and connect with one person than a group. I'm thinking that I need to hold the feelings that come up with private class in memory when I'm teaching public classes. On Friday the cute guy and I celebrate the anniversary of our first date. So much has happened since then and I am grateful for who he is and also for who I am when with him. It is very freeing. What is time and how do we measure it? Moment to moment, month to month. We move through our lives, changing with each experience, becoming or not becoming as the case may be. I'm in a good space right now. There are moments of uncertainty, as there will be when starting something new, but when I look at the core of it I find that I'm comfortable in my own skin. I am in a good space. Wishing you find the same. Who am I? This question keeps coming up. It's one that I have thought about over and over... approached from different angles over the years. As a child I didn't think about it much - I was just aware that there was more; more to me, more to life, more to where we are and when we are. I feel that children are truly more connected to themselves - at least until the everyday world starts pulling them in. Perhaps it is just that at this point in my life I really need to give attention to this question? Who am I? A woman who was just going along with the motions until something happened to shake it up? No plan, no rhyme or reason until recently. It feels weird to call myself a woman but, at thirty, 'woman' is more appropriate than 'girl' - even though I still consider myself a girl. During my yoga teacher training this question came up. I have it written in my notes, 'the inquiry of yoga begins with the question: who am I?'. We give ourselves permission to inquire into the nature and content of our own experiences. By dedicating ourselves to svadhyaya we reflect; look within and see what inspires us, what moves us and ask the question - who am I? I'm glad to know that I'm not the only one asking this question. On my return home I found myself in... limbo? Still didn't have a plan, still trying to figure out what I wanted to be doing. The cute guy was looking for a space for his studio and I was helping... I'm not sure at what point I decided to look for a space for myself as well but somewhere along the way the 'search for a space for him' turned into the 'search for a space we could both use'. In the third week of December I attended a Self-Mastery Intensive Workshop at the Blue Star. It wasn't something I had planned to do but was somewhat tricked by my brother into going. Ergh? Sometimes we need to be tricked into doing things that may be good for us. The very first line of my notes from that workshop reads: 'I am: a soul having a human experience -> what does that mean for me?' What does that mean for me? I'm still working it out. I feel as though I will forever be working it out. On the second day of the workshop we talked about recognition of who we are; that the journey never ends and that the moment we find ourselves asking this question - Who am I? - we become the Seeker. What am I seeking? Knowledge, understanding, inner peace? I think I'm currently seeking to know why I'm seeking. Would like to just sit back and let life be but apparently some part of me has shifted and I can't get back to being... complacent? There are variations to the question. What am I? What is the All that I am? Is there more of me to be experienced? Am I experiencing all that I am? What else am I? What is the More that I am? What exists when the form is taken away? I'm trying to keep them in mind. It's almost the end of January and I find myself preparing a space in which I can teach yoga - asana? meditation? breathing? Yoga. My brother says he is not sure I can teach anyone as he does not think I have been practising enough. What should I be practising more of? I find myself examining even more the Who am I. What do I want to offer people? What is my purpose for establishing this space? The word that comes to mind the most is space. Sacred space. Sharing sacred space. A space where people can come for a moment of time and just be. Reconnect. Stretch. Breathe. I think I'm okay with that. Who am I? A Seeker... one who does not know how far she has to go but is fine with that. What am I? In this moment, content... and sleepy. Tomorrow the cute guy and I are going to be signing a rental agreement - we've been looking for a space in which he can have his photography studio and, I'm not quite sure how I got involved but, I'll also be using the space as a yoga studio. We're sharing. It starts tomorrow. It's exciting and scary and... awesome. On Friday I had dinner with two women who I worked with at my old job - one moved on to other adventures some time back and one is still there. The conversation was interesting - catching up on where we were and what we're doing. How have we gotten to where we are now? It's something I've been thinking about a lot. When I was 13 we had to choose subjects - I ended up in the Business stream only because of the fact that I wanted to do Information Technology as one of my subjects; it was only offered in the Business stream or the Sciences stream and I definitely was not interested in pursuing strictly Science subjects. One decision that led to a BA in Business Administration, a job in an office and then an MBA because... progression? It served its purpose - I needed a job and I had one and now I'm moving on to find out what I really would love to do. My dad is unhappy because he thinks I'm going about it the wrong way - that I should have stayed at my old job or find a new job (which provides steady income) and pursue this - whatever this is right now - in my spare time. Pfft. I need to do this my way. Need to figure out, to find, to look for what will satisfy me. Is it teaching yoga? I'm not sure - but I'm open to the possibility that it might be or, that this will eventually lead me to somewhere I want to be. Is it writing? Perhaps - this is something that's always in my mind and so I'm sure the time will come when I pursue it further. Is it taking one day at a time and enjoying each experience? Yes. What will be, will be. I'm looking forward to it.